I had one of those nights that I just couldn't sleep so decided to get up and make a card, and have struggled all week with the challenge over at Muse. Quite a few cards have been put in the recycle bin! But came up with this idea using a Tonic butterfly punch and putting some melon mambo behind which has been stamped with a hero arts butterfly,did it in black so it would show through the butterfly better. This is lovely...I like how you lined up the butterflies...I think you have inspired me to get out my butterfly punch! 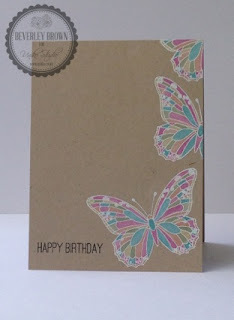 Love the way you've interpreted the butterflies and made the card your own! So glad you joined us at Muse this week! Hello Jenni, I absolutely love your butterflies. They look so beautiful. I think your card is a great representation of the Muse card. Great job.